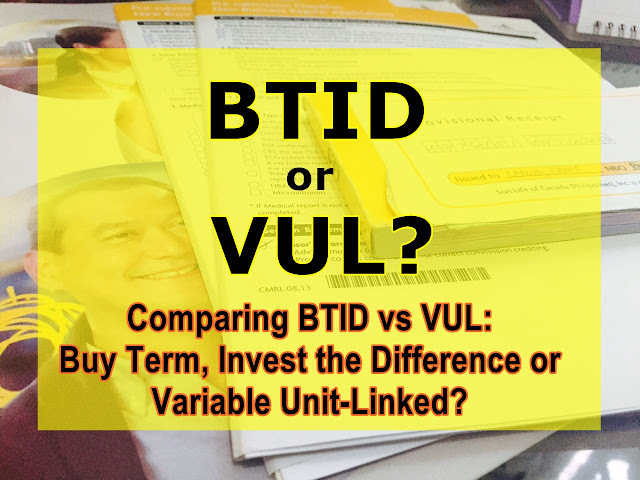 Comparing BTID vs VUL: Buy Term, Invest the Difference or Variable Universal Life Insurance? Should you BTID (buy term insurance, invest the difference) or get VUL (variable universal life insurance)? This is one of the most controversial topics in the investments and insurance industry. People of different walks of life have their own opinions about this: some say that buying term life insurance and investing the difference is better, while some say that getting your own variable-unit linked plan is the greater option of the two. Before we start with comparing the two, let's identify the two terms first: BTID and VUL. Term Life Insurance: provides insurance coverage and protection for a limited time period (term) as long as you're paying. Mutual Funds: collects & combines money from different investors with the same investment goals. These collected money are handled by a professional fund manager who invests according to the investors' preference - whether in stocks, money market, bonds and other securities. For example, Naruto is 25 years old. He has a budget of P54,000 yearly. If he gets a 10-year term life insurance, he's covered for 10 years as long as he pays during those 10 years. This is the cheapest as he's only "renting" his insurance. Once the term of 10 years is over and he's still alive, the money he paid won't be returned. At least he's still alive! For term life insurance with 2 M death benefit, Naruto will pay P12,270 a year, and invest the remaining P41,730 in mutual funds for 5 years. For the next 5 years, he'll pay P12,300 a year and invest the remaining P41,700 in mutual funds. VUL: a life insurance plan with an investment component. If you get this, you'll have income protection plus an investment managed by the company's fund managers. This isn't exactly cheap since its paying period is compressed while its protection period is long-term. Some VULs allow you to deposit for 5 years but you're covered until age 88, while some allow you to deposit for 10 years and you're covered until age 88. For example, Sasuke is 25 years old. He has a budget of P54,000 yearly. For VUL with 2 M death benefit and a mutual fund investment, Sasuke will deposit P54,000 per year for 10 years. For term insurance, you can arrange an automatic debit so you can deposit your premium regularly. You can view your insurance coverage online. For mutual funds, since it's done separately, you have to do another application for mutual funds, and then do another bank enrollment for you to invest regularly. You can view your mutual fund investment online, but again, you have to register it separately. Here, you apply for VUL, enroll for automatic debits and register online so you can monitor your insurance coverage & investment by doing an all-in-one process. There may be some instances wherein the insurance company may require you to undergo a medical exam once the renewal period of 5 years is over. If you're declared medically unfit, you may be denied insurance protection, or you may be charged with a much higher premium. The total cost depends on the financial goal of the person. Naruto needs to be covered for only 10 years, so he decided to get term life insurance and invest the difference. Sasuke got a VUL for his 10-year protection. Naruto needs to be covered for 20 years. Sasuke got a VUL for his 20-year protection. Yes, you can set automatic debits to your term life insurance. Yes, you can also set online automatic fund transfers to your mutual fund account. I'm speaking from experience: You can do automatic fund transfers to your mutual fund account, but you have to manually to an order ticket online for your mutual fund subscription to be processed. And you know what they say - personal finance is 80% behavior and only 20% skill. So, you should be disciplined enough to manually make mutual fund order tickets every time you want to invest - and you have to do this regularly. You only need to deposit to one account and your deposit will be divided into payment for life insurance and investment for mutual funds automatically. Nope, you cannot compare BTID vs VUL at all. BTID is for people with short-term protection needs and super disciplined saving and investing habits. On the other hand, VUL is for those with long-term protection requirements (because VUL can also have additional riders with hospitalization allowance, etc). It's also best for people who are just getting into the habit of saving and investing. At the end of the day, BTID is comparable to planting a tree and taking care of it every single day; whereas VUL is letting a trained and professional farmer help you into caring for your tree. Whichever way you go about it depends on you. What's most important, though, is that you get started in planting a tree - even though you think you don't need it today, your future self will definitely thank yourself for thinking ahead. Protect your family AND invest for the future with a VUL like Sun Maxilink Prime. Fill out this form now for your FREE proposal!